-1.4% MoM - GOOD NEWS finally. Down from 3.7% annual rise to 2.5% annual rise over the past month. GOOD NEWS. Yes, 0.28% rise YoY September to September. And -0.5% QoQ June to September. Published figure +1.8%. They really are clutching at diarrhoea. I wonder what the real numbers are? Last month revised down from +0.1% to -0.2%. Stopped this month's figures being even worse (and last month's being negative as well). God only knows how they come up with the quarterly figures of +1.8%. Am not so sure, six months ago, their average price was £4k lower than it is now. Lots of scope to avoid a YoY negative for a while yet. Not suggesting you are a Deity ... but this is an excellent clear post - thank you. Am not so sure, six months ago, their average price was £4k lo﻿wer than it is now. Lots of scope to avoid a YoY ne﻿gative for a while yet. So got to lose 2% (or so) in 'the next couple of months' ... at least now mathematically possible. Regional data due out on the 10th, should be interesting to see if it shows London and SE England falling as the ONS index did. for facts HM Land Registry Service is the only real credible source. All the rest is fictional... on what has been borrowed. Whatever the source, do you really think a balls deep V.I. would play a straight bat? I wouldn’t. Do you remember Libor being rumbled? Gullible Joe Public ripe for being played. Reason is the first casualty when the red mist descends and £’s fog the brain. Absolutely land registry figures are all that matters. There does seem to be a lack of decent properties here in Cambridgeshire available. I.e nice detached or 3 bed semis priced around last sold price. Yes there are lots of new properties on the market but they are either BTL flats and maisonettes or have no garden or parking or are unrealistically prices so in reality not on the market (i recon about a third of the properties on RM are so unrealistically priced they spend no chance of selling therefore not part of the market. Anything nice and reasonable with garden and parking and priced ok compared to last sale on street (still high) seems to go within a couple of weeks certainly not months. @ElPapasito, wonderful work with the spreadsheet! How about one of those "fan charts" the BoE love to show that graphically? I have a feeling next month will reverse this month, so up 1.4% - presumably that keeps YoY at 2%? Unbelievable isn't it. 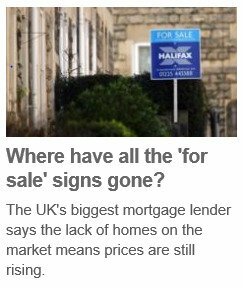 BBC couldn't bear to go with the MOM negative story as the headline and went with something of little relevance to the recent figures that comes as no news to anyone. Thanks all for the analysis of the figures. Forget the BS from the VI. Go out and look at properties and talk to agents. Agents are getting desparte. The market is turning. I looked at one recently listed as overs over. Been in market 6 months are reduced a few times. I offered 10% under. Surprisingly i had their full attention. Vendor indicated he would sell for 5% under. Last btl has bought. fTBs are trying up. Even the top end 4 bed plus large garden is sticking now.